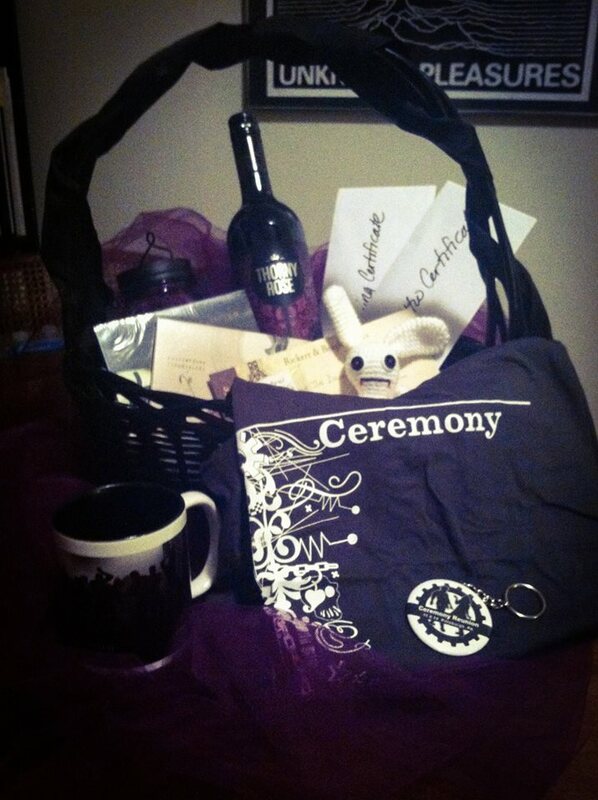 Up for raffle tonight will be a Ceremony gift basket jam-packed full of goodies. Items inside include generous gift certificates and merchandise from our vendors, super-limited edition keepsake items we made just for the Reunion, and a bottle of wine for good measure! The raffle table will be on the main (upper level), which is also where we’ll be drawing the winner at 11:45 p.m. Raffle tickets are $1 for 1 ticket, $5 for 10 tickets, and $10 for 20 tickets. You’ll also be able to directly purchase a very small number of the keepsakes (key chains, magnets, and mugs) and the LAST few remaining Ceremony T-shirts. Get there early before they’re gone!